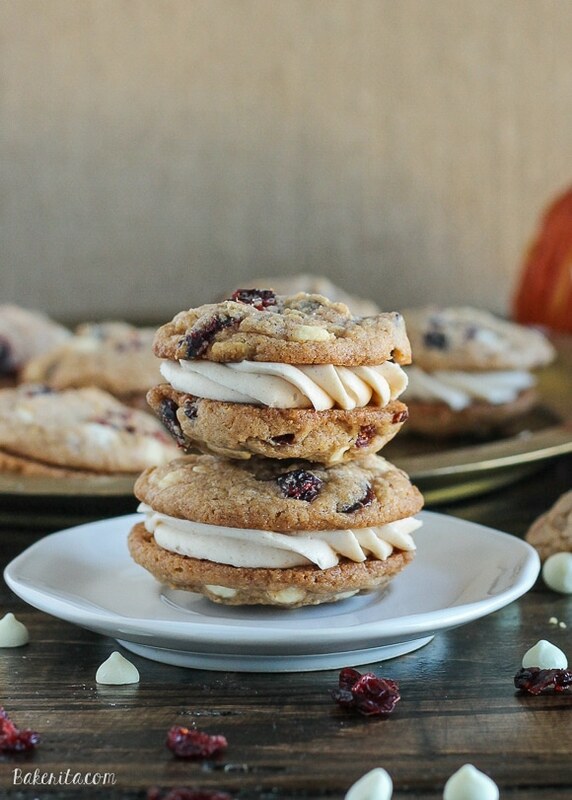 Pumpkin Spice Cookie Sandwiches with Cream Cheese Filling are easy and delicious! 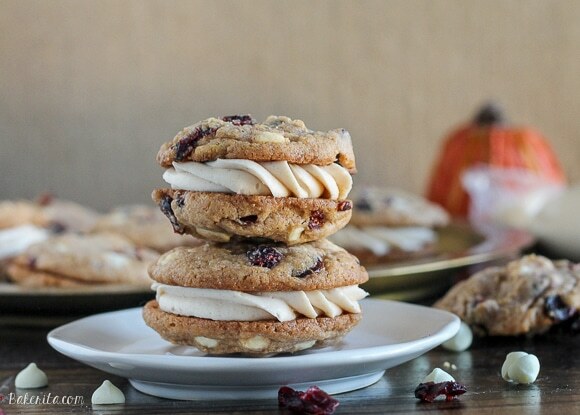 Added white chocolate and dried cranberries make these pumpkin spice cookies outstanding. Need a super quick and easy last-minute Halloween-worthy dessert to help you pregame getting candy wasted? 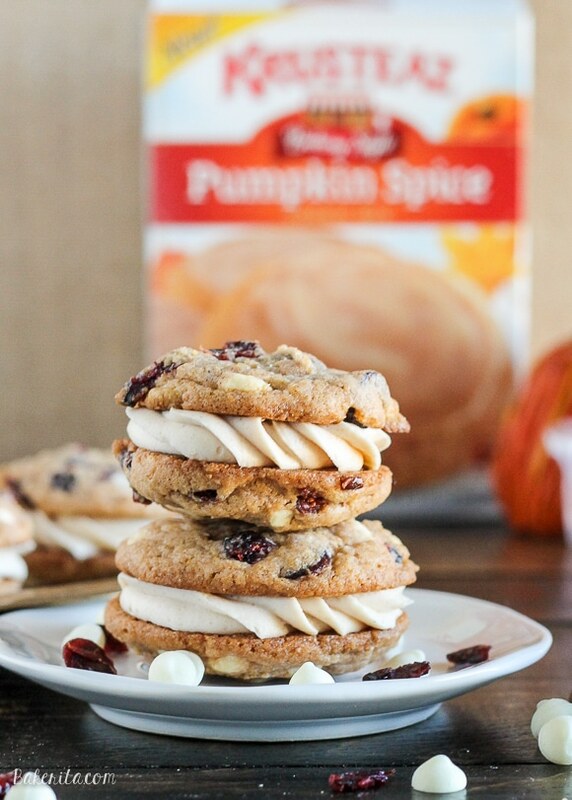 I got you covered with these pumpkin spice cookie sandwiches with (yum!) cream cheese filling. These are not ~spooky~ Halloween-y, they’re more of just fall themed cookies, but that’s a good thing because it means you can eat these whenever you want pumpkin spice. They key to these super easy cookies is Krusteaz Pumpkin Spice Cookie Mix. I first tried these at the Krusteaz test kitchen when I was there touring with the Baker’s Dozen the day before the International Food Bloggers Conference. There was a pile of them, frosted all beautifully and with added dried cranberries, sitting on the table when we were learning all about mobile food photography, and they definitely made a stunning subject! After grabbing one then, and a few the next day at the cookie swap, I was itching to play with the mix and put my spin on it. I loved the dried cranberries the folks from the test kitchen had added to the mix when I was visiting, and so I decided to go off that inspiration. I added dried cranberries and white chocolate to the mix and baked up the cookies ’til they were just getting golden around the edges. You want these just baked enough that they’ll hold together but still super soft so they can mold around the delicious cream cheese frosting. That cream cheese filling couldn’t be easier! The Krusteaz mix comes with a packet for icing. Instead of adding milk to make it into a glaze, I whipped it into some cream cheese. I wanted it a little thinner, so a tablespoon of milk did the trick. It tastes tangy and with the hint of vanilla – it’s the perfect filling to complement the sweet and spiced cookies. Click here to get the easy instructions on Krusteaz.com. These look so perfect! I feel like they’re the perfect replacement for ice cream sandwiches! These look unbelievable, Rachel! I seriously wish I had time to make them this weekend, but I will have to try them soon. Happy Halloween! Oh these sandwich cookies are just so darn pretty!! And they sound fantastic too! Happy weekend!! I love the idea of adding cranberries! Cranberries and apples are my favorite in the fall. That swirl of frosting is really what’s getting to me though! 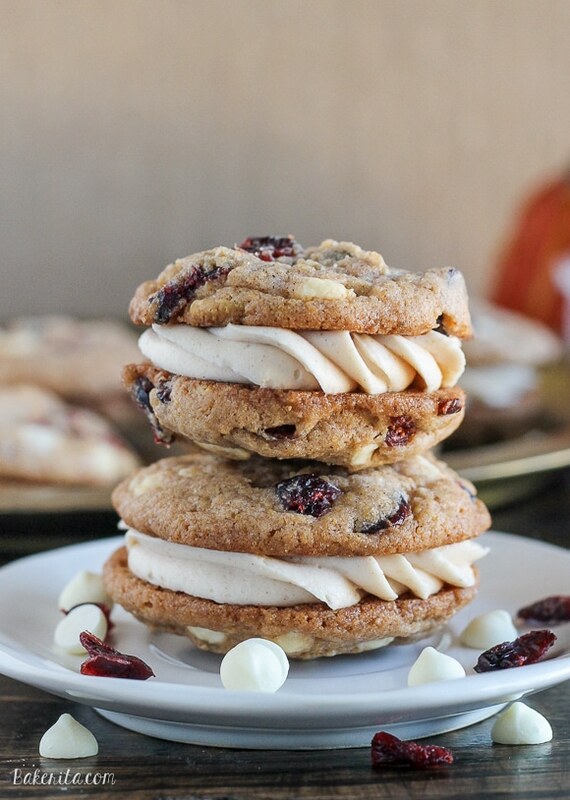 I love cranberries and white chocolate together, what a great idea to put them in a pumpkin spice cookie! Pinned! The cookies alone sound spectacular, but then you go and make fabulous sandwich cookies with cream cheese icing!!! Swooning!!! These are so beautiful and everything you could possibly want in an autumn cookie. Beautiful photos!! These sound fabulous! Love the flavor combos. Yum! !